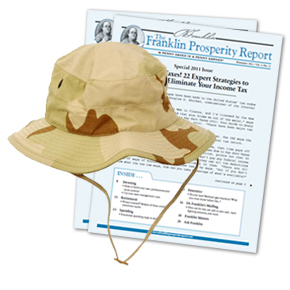 Exclusive: Newsmax.com is proud to offer the U.S. military's Desert Camouflage Hat — the same kind of hat worn during Operation Iraqi Freedom by our combat troops and embedded journalists. These hats were designed for military specifications, to provide excellent sun protection and comfort under extreme heat and sun conditions. These ruggedly constructed hats performed so well during the war, they became one of the hottest souvenirs among our troops. Now you can get your Desert Camouflage Hat (also called the Desert Boonie Hat) for your own pleasure — wear it for gardening or hiking, at the beach or swimming pool — just about anywhere in the great outdoors. It's fashionable for men and women! The Desert Camouflage Hat is tricolor and constructed with poly/cotton ripstop material; made to government specs; includes screened side vents for cooling and chin-strap with branch loops. Remember, the Desert Camouflage Hat provides 75 percent more sun protection for your head than a baseball cap or visor — protecting more of your face and even your neck and ears from harmful ultraviolet rays. These extremely durable hats also were designed to keep you cool in the hottest temperatures. In extremely hot conditions use the soldier's trick: Soak the hat in water, wring it once, and wear it! The Desert Camouflage Hat is one of the coolest items you can wear — while reminding America of our victory in Iraq. Size: Hats come in small (7), medium (7¼), large (7½) and X-large (7¾). The average male's head would comfortably fit a large size. Camo Hat is designed for military specifications, to provide excellent sun protection and comfort under extreme heat and sun conditions.